It’s been over a year since I did my first sacred spaces post. It’s time for another, I reckon! FranIAm was nice enough to answer my questions. Thank you, Fran! Fran was born and raised Catholic, and promptly removed herself from faith practice at the age of 14. She spent many years seeking, and while never losing faith, she did not follow any typical faith practice, but studied Christianity, Judaism, Hinduism and Buddhism. Somehow, by age 32 she wandered, albeit reluctantly, to the faith of her youth. At age 51, she remains there, fully immersed in life, work and study… recalcitrant and rebellious as ever, but still at the table. Splotchy: What religion will be talking about? S: In this religion, is there a concept of sacredness? Of the holy? F: Yes, a most profound sense of sacredness and holiness and in particular around churches and shrines. And even with in the church, there are the truly sacred spots. S: Is there a concept of a sacred space? A location that that has been imbued with some properties of holiness? F: The worship space – or main body of the church is called the sanctuary is where the community gathers for liturgy and worship also known as Mass. This is a holy place. There is a tabernacle which may be somewhere in the main sanctuary or which may be held in what is known as a Reservation Chapel; that is where the consecrated bread is kept, which is for Catholics the Body of Christ. This is the holiest place and requires reverence and silence. The altar table in a Catholic church is supposed to have a relic in it, meaning some object of a saint. It could be a bone, a tooth, some hair – that is built within. I don’t know if modern altar tables have this. It does imbue a certain sense of ancient holiness to some and is meant to be a link to the past. S: How is a space imbued with holiness? F: This is my own opinion – I think when any place is a place where people have gathered to celebrate, to mourn, to pray – that a sort of patina forms and it is holiness. I had a great sense of this in the Holy Land where there are often “duplicate” locations of some holy moment. As far as commissioning a church or holy space, it is with prayers and rituals that have been used in the Roman Catholic church over time. These rituals must be executed before a space can be used for worship. S: Are there instances where a sacred space is deconsecrated, where its holiness is removed? F: The holiness itself is not removed per se, but rather the ability to celebrate sacramental worship there. And yes – this happens when churches are closed. S: How is a sacred space deconsecrated? F: There is a ritual, the altar table and tabernacle are removed. Thank you very much to Fran for answering my questions! It’s been pretty crazy goings-on at the Splotchy house. We’ve been getting ready for the sump pumpening of our basement, and we’re taking a family vacation tomorrow that we have just started to prepare for, and that’s just half the stuff I can tell you about. So, this blog will be a little light for the remainder of this week. 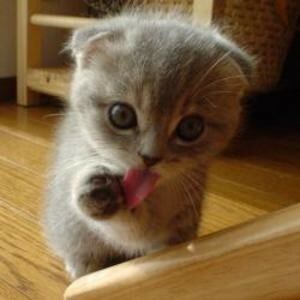 However, fear not — I have an idea to keep you entertained here in my absence. Check back later today. Another entry in my new musical — The Road Warrior. Description: Humungus gives the villagers a chance to turn over the oil-producing outpost. 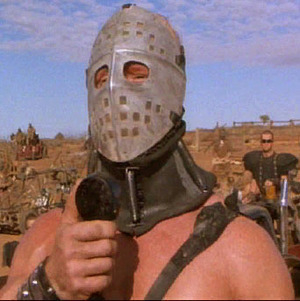 Posted in musicals, the road warrior. 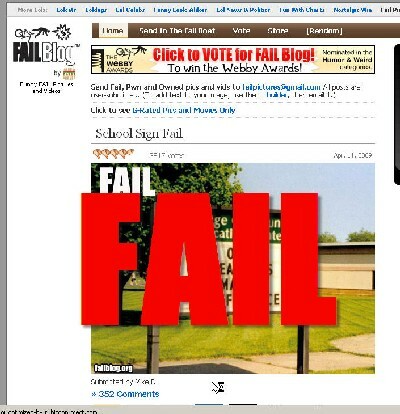 I think I saw the first FAIL pictures very soon after they started popping up on the web (a year ago? a year and a half?). I thought the first ones I saw were sort of funny, but then these kinds of pictures started appearing everywhere. Next, a few sites sprung up, devoted to all things FAIL. 1) Most of the time, it wasn’t funny. 2) It was often mean-spirited. 3) I’m tired of people lazily shitting on other people/things for a cheap laugh. 4) I’m tired of people lazily shitting on other people/things in general. It’s okay to make light of others on occasion, etc. (hey, it must be okay if *I* do it! ), but for something to have sneering at anything and everything else as its sole purpose — well, it’s just too much for me to take. For this, FAIL meme, you fail. Posted in blogging about blogging, meme.